In August 2010, Haley and I had decided to take 2 weeks off. Haley was just about ready to chew a lump out of her computer and throw undergraduates through her 3rd floor office window, so a break was very necessary. We phoned a variety of travel agents but because it was all done in rather a hurry, with only a weeks notice, there was nothing suitable. We considered going on a cruise, but Haley decreed it was SilverSea or nothing. Cruising was off. We both like cycling but Haley is rubbish with hills. We did not want to fly anywhere, so the obvious choice was to catch the train to Brussels and potter about on the bikes. We have gorgeous, little, folding Brompton bikes which we both adore. There are plenty of companies which will rent you bikes and ferry your luggage from guest house to guest house (Skedaddle, CTC are a few we considered). We decided we would do it alone. It wasn't just the cost although tour companies are very much more expensive than the equivalent days in nice hotels, and don't usually include flights to the starting point. We wanted to go at our own pace, did not really want to be sociable with the rest of the pack after a hard day's cycle, and wanted have flexibility to change plans en route. Plus the tour companies usually offer unidentified guest houses. The alternative is to carry everything with you. It was amazing how much you don’t actually need. Padded cycle shorts - We were skeptical but after the first 50 miles we found they were a godsend. We got undershort variety so you can wear normal clothes over them. It does feel like you are wearing a nappy when you walk in them. Don’t wear pants (those are British not American pants) with them. It might seem gross but trust me. Sugary snacks - Kendal Mint Cake would have been ideal, but for us it was Jelly Babies. You need something which will give you enough of a boost to carry you through a few extra miles at the end of the day. Sturdy pannier bags - we bought the Brompton own brand ones with bracket. It was incredible how much weight they can take, thanks to the excellent design. Much better to push it than carry it. GPS - We bought the iPhone app Trails. It will cache maps (from OpenCycle map) so you don’t need to have a working cellular data network available. We would been lost without it. Literally lost. It has loads of great features e.g. recording your route. The cycle through London we suspected would be the most stressful part of the journey on Day 1. Not at all. Boris has done a marvellous job of creating dedicated cycle paths and lanes, some of which even have their own traffic lights. We both felt much safer than cycling around Cardiff - with its onesize fits all, bus-taxi-cycle lanes. 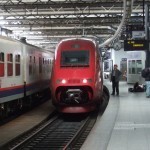 The Thalys train is flame red, but be careful at Brussels International station, they might be typically belgian and switch the platform on you with 5 minutes to go and only make the announcement in Flemish and French. It was a miracle we made it. We arrived in Amsterdam in the early evening having left Cardiff in the morning. You could have flown much quicker, but we were on holiday and the journey was part of that. Anyway trains are great. We spent a couple of days in Amsterdam doing touristy type things which you can read about on the part 1 of my Eurocycle blog (written en route using the marvelous iPad). Leaving Amsterdam in a southern direction you should look out for the combined LF2/LF7 route. At waymarker 62 these two routes separate. We went South West on LF2 toward waymarker 68 - 01 - 39. We carried on following the LF2 until point 05, where we headed towards Leiden 05 - 73 - 74 - 70. Its a beautiful cycle mostly along canals with lots of windmills. Very friendly dutch, lycra-clad giants offered help to a lost looking welshman and his wife. We had actually bought a map but because the first part wasn't on it we were totally unprepared for how long it would take and arrived just after dark. I would not recommend cycling these routes in the dark because they are mostly unlit and some of the paths are veeeeery narrow, alongside canals. We were staying with a friend in Leiden who welcomed us into the house, exhausted, slightly smelly, and in desparate need of a strong cuppa and sit down. She then made us cycle across the city to a restaurant. I very nearly dozed off in my soup. Fortunately, nobody noticed. You can read all about the journey from the blog I did at the time. If you have a GPS machine or a GPS smart phone app (like the rather good Trails) handy you can download our route for day 3 (GPX format). We left Leiden quite early and had a very enjoyable lunch in the Hague during the heat of the day in a square just behind the Binnenhof. There were lots of business men and women, all looking the trendy mix of professional and fashionable, and us in our cycling gear looking grubby. Delft was our next destination and is a beautiful place with a gigantic Nieuwe Kerke (New Church). It is rather strange because it was built as a Lutheran cathedral, so unlike every other cathedral or large church I've been in there is no focus towards the east end where the high altar would have been. Have an ice-cream and sit in the square gazing at the Kerke at one end and the equally stunning town hall at the other. It was so hot, my ice-cream made a bid for freedom down my inside leg. Most embarrassing. The cycle to Rotterdam was less pleasant because we were rather tired, hot and my knee was playing up. We may also have gone the wrong way once or twice which is never good for morale. Our hotel was a corporate, businessman type of hotel with no soul and certainly no room service. Despite lots of pain in my knee, we hobbled off to find dinner in this industrial city. You have to look really hard for something nice, but eventually found a charming deli which turned into a restaurant at night. 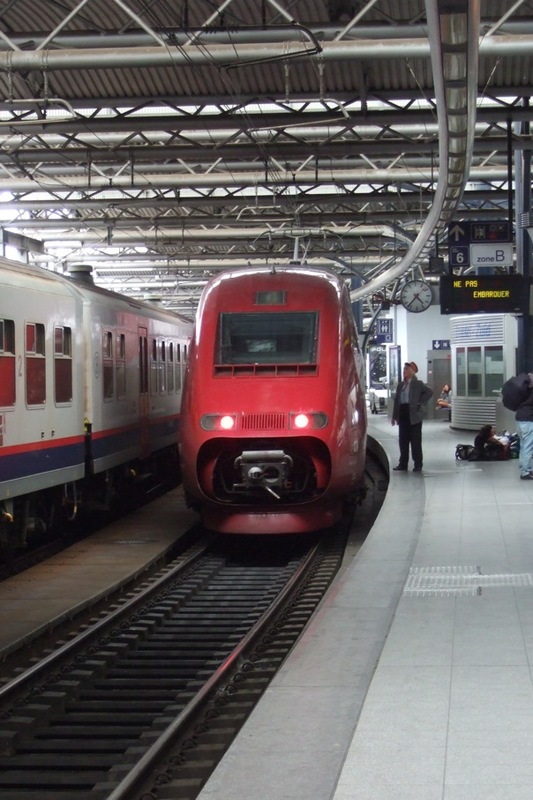 The next day my leg was so bad we had to change our plans and catch the train all the way to Antwerp. There we had a marvelous time, staying in a gorgeous boutique hotel (Hotel Julien) and catching up with the adventures of the little giantess (an annual city-wide artistic spectacular). When it was finally time to move on we left quirky Antwerp on the faithful LF2 just outside Antwerp castle and the statue of the giant who used to rule the city. The weather was decidedly grotty and as we cycled warily through the industrial part of the city that the cycle path dragged us through, the rain came down. We had light-weight waterproofs but quickly these became drenched and rather cold. We stayed on the LF2 until the town of Schelle, then we jumped onto the LF5. One of our friends, Sarah (who blogs over at One Small Step) recommended the Temse to Dendemonde route, and she was right - it was a beautiful cycle. Make sure you jump over the river and have a look at the little market town of Temse. My knee was totally knackered by the time we got to Dendemonde so we elected to take the train the rest of the way to Ghent. Sadly Ghent was a bit of a let down after all the fun to be had in Antwerp. There were some pretty bits but most of the city seemed to be under heavy re-construction. 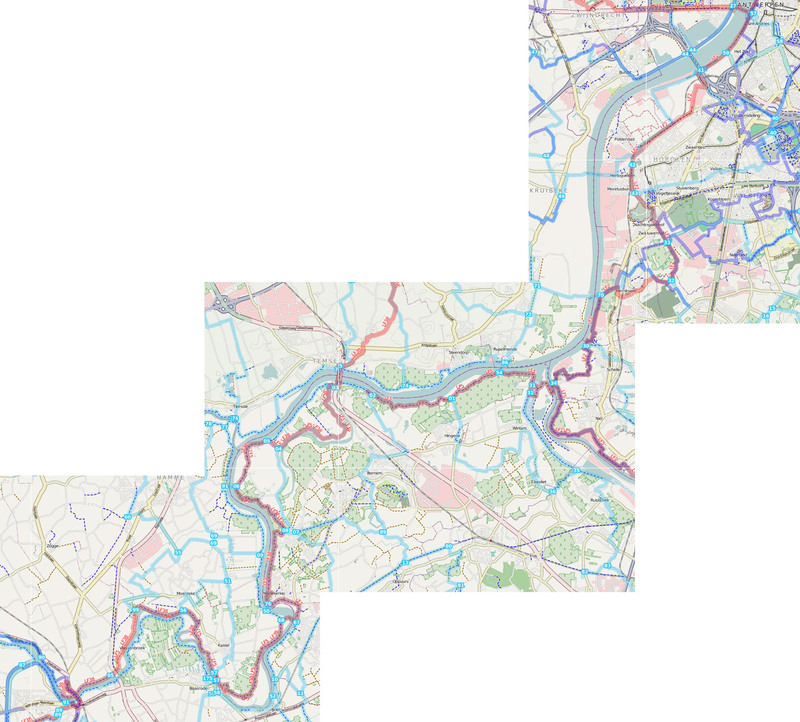 You can download our route part of day 5 and all of day 6: Temse to Bruges for your GPS thingy (GPX format).